I have K20D. I used to have Canon 350D and Sigma 70-200 EX (no OS). With the Canon I had to use shutter spees of 1/500 or so and still there were some images with shake. With the Pentax and a 200mm m42 prime the camera likes to default to 1/90 - I shoot over 90% of my images at that. There is never any camera shake. Never. I also do shoot with 300/4 prime - 1/90 and never camera shake. 500/8 mirror - 1/90 and never camera shake (though the lens is not tak-sharp as 200&300 are, so...). 1. the SmugMug lightboard which you can access by clicking onto any of the images contains now contains a scan of ColorFoto's 2010 results at 130mm and 1/200s, 1/100s, 1/50s etc. as well. Have a look if you're sceptical. 2. 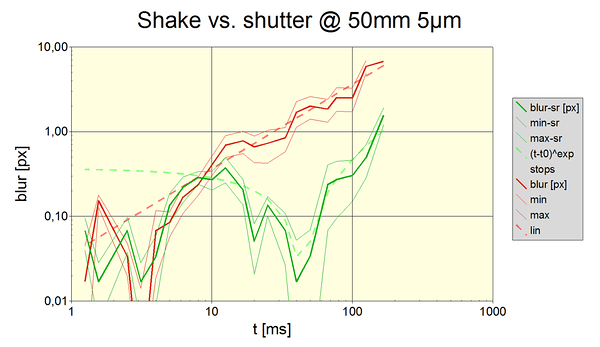 I am keen to receive any serious test data which show a significant SR effect at 1/180s or faster. Explain me, please, my problem - I have K200D and have a lot of blurred photos with SR OFF at "border" shutter speed - for example, it's 1/60 for FA43 or 1/200 for FA135. With SR ON - the situation is better. But my old *ist DS with worse mirror slap and lags of shutter was better. I had no any problems to shoot with FA43 at 1/60 and even at 1/50 without any SR. FA135 was better at 1/200 than now. I think that it's a problem of SR technology. Well, I can only speak of my own results - as the system works really well for me, I have no motivation to do proper scientific study. I shoot only with m42-lenses, mostly in the 135-300mm neighbourhood. I only use very sharp prime-lenses, and regardless of the shutter speed (which is usually 1/90 unless I need up it to stop motion of the subject) there is _never_ observable camera shake in the images! Measuring it with high enough sub-pixel accuracy might reveal a little bit of blur, but not enough for it to have any significance even in the largest of prints. If everybody comments as Anonymous, not giving some name or avatar, I'll be going to disable the anonymous comment option. IMHO, doing anonymous comments is a lack of civilized behaviour. First, you're 'ogl' and I already replied to your question in the forum you asked the same question. Second, I am almost sure you compare pixels on a 6MP camera with pixels on a 10MP camera. Which entirely explains your observation which BTW isn't SR-related. 135-300mm at 1/90s can look relatively sharp, e.g. looking at my chart, you can expect additional blur due to shake motion of about 1px which I called "soft". You won't really notice it except at the 100% crop level. Also, YMMV. Again, pls read the article. I dodn't say SR won't work at long focal lengths. I said it won't work at fast shutter speeds to help make your tele shots tack-sharp. As an engineer I appreciate your and labnuts work. Very good. I am not quesitoning the test results but I am questioning the conclusions that SR is not useful for lenses above 100mm or so. Both your tests, Psmiths and the ones at Colorfoto show that the effetiveness at long FL increases as you increase the exposure time below 10ms (1/100). THe desired result is to reduce blur with Long FL lenses as you increase FL. Thus if I had a 200mm lens and the benefits of SR kick in longer thab 10ms, then I am achieving my objective since this is precisely the zone (>10ms) I want SR. It may not matter much if it is less effective in 1/100 (10ms) or 1/200 (5ms) because I want it to be most effective at the longer focal lengths. I do care about how effective it is with longer lenses in the desired range (= 1/100 to 1/25 for a lens of this FL=200mm). 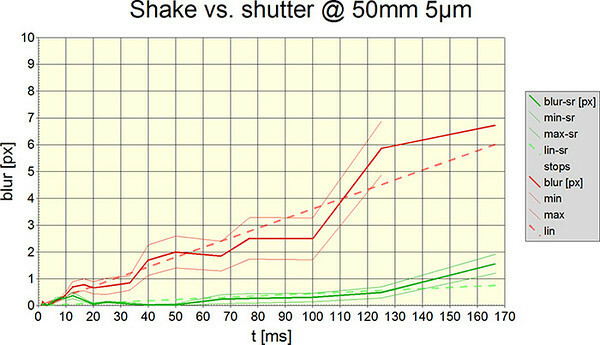 At faster shutter speeds it is not as much use. Is this not the results shown by Colorfoto and is this not a good design objecive. Anecodtal evidence is provided by those who have shot at 500mm with good results at 1/50 or even as low as 1/15. Rupert of the DPReview fame is one person. However, the following is too important a consideration to be dismissed and therefore, to be taken into account in my conclusion: If I shoot at, e.g., 250mm rather than 125mm, then I cannot normally tolerate total blur to exceed 1.5 px. Because otherwise, I could have shooted at 125mm in the first place. This is something many people forget to consider. E.g., in a discussion about tele converters .., or as in this case, SR efficiency. A brilliant post. Pentax should hire you immediately as an independent consultant. I can only image what you would do with access to their confidential engineering data. Well I really did not believe your tests and results. However I just took about 100 pics using my DA55-300mm (nice wide range to play with) and in every case it was in agreement with your chart. BTW this is with my K20D. It seems to not work much at 300mm, 1/180 had the same results with or without SR on. :( hmmm I can only conclude that my thoughts of that big heavy platter moving at high speed and compensating is not possible. Most don't know when we wait for the shaky hand the sensor platter is just sitting there and there is no power going to the coils until you press the shutter button. Than it jumps up and into position. This is a much slower (logically) system compared on one on rails and able to move more freely with faster response due to it being small (the sensor platter) and directly connected to the actuators, there is no lag. However the system still jumps up and into place when someone shoots a K-7 at 1/8000 of a second, I guess there is no time to jump up into place and compensate once the shutter reaches a certain speed. Hope folks understand. Nothing is happening but the gyros gathering data when waiting for the hand, when you see the hand the SR computer has enough info on the shake, when you press the shutter button the platter jumps up and into a compensating position, the faster the shutter speed the less time it has to counter shake as the shutter is open. If SR is off all it has to do is pull the sensor plate into a square position and not move it to compensate for shake. I mean picture that... its amazing it works at all. @jamesm007, thanks for your comment. Note that I am in the middle of rewriting this blog article. A lot of it as it is now turned out to be false information. SR actually IS effective at 300mm (well, can be). I have just tested my K7 (firmware 1.03) with an FA 80-320 lens at 320mm. Using shutter speeds of 1/45 and 1/180 sec, I made 10 exposures of an auto license plate ~50m away with SR off, and then 10 with SR on, for 40 exposures total. The test was whether the license plate was legible or not. At 1/45, 2/10 exposures were legible without SR, and 9/10 legible with SR.
At 1/180, 4/10 legible without SR and 9/10 legible with SR. I am satisfied that SR on my K7 works with focal lengths over 300 mm and shutter speeds shorter than 1/125 sec. Thanks for sharing your results. I confirm your findings. An major update to my blog article is ready and awaiting feedback from Pentax. Stay tuned. Great in-depth research. I’m looking forward to your update. While I (still) have a K100d and these results might not apply to my camera, this is food for (critical) thought and inspiration to do my own investigations, albeit on a smaller scale. Falk, any news on the update? I'm trying to decide between using the SR with a Pentax 55-300mm or use the OS on a Sigma telephoto zoom. 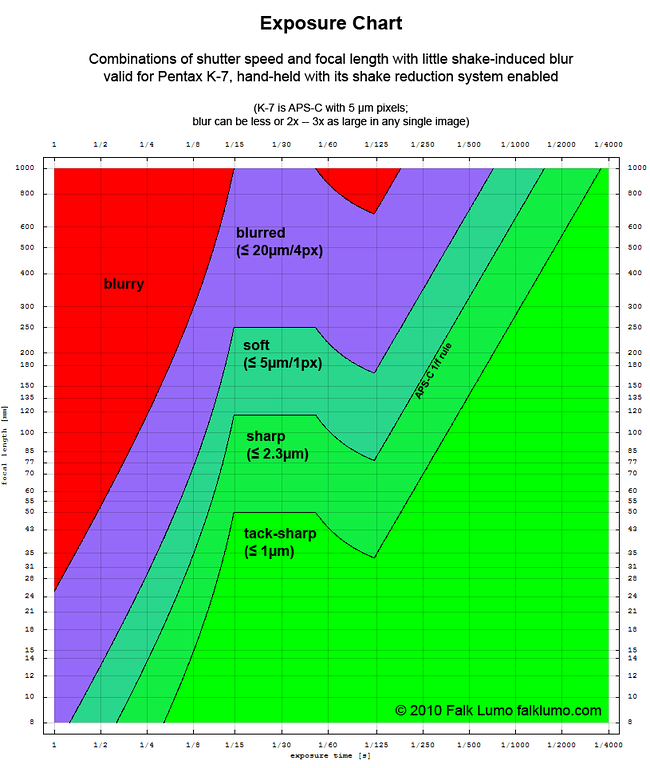 this article ("Pentax Shake Reduction revisited") led to an even more extensive work to understand the appearent inefficiency of SR around 1/100s. The work about shutter-induced blur. As it turned out, the SR actually works for all focal lengths and exposure times but cannot counteract the shutter-induced blur. So, SR is most effective for short focal length and exposure times slower than 1/60s, and very long focal lengths and exposure times faster than 1/200s. If effective, it wins about 2 stops on average. As soon as measurements for the K-5 are in, I will update this article (and chart) for the K-7 and K-5. The current chart is too pessimistic below 1/200s. Many stabilized lenses win about 2 stops as well (even if declared to win 4 stops) and therefore, will be about the same as the Pentax in-body SR. If you can find a quote that the OS on your Sigma tele lens gains more than 2 stops *on* *average* then you may start to see a benefit. Falk, thanks for the excellent response. I read through the rest of your articles and am quite impressed. I'm not too surprised to hear about shutter induced blur, as it makes since considering the forcefulness of the K-7 shutter. I am glad to hear however that the in-camera stabilization works for longer focal lengths. Do you suppose ColorFoto's results for 200mm were due to the shutter blur as well?